The Healthy House is a 3 bedroom end-of-terrace, built of natural and recycled materials which is designed as a chemical and toxin free building. The house has a wooden frame with a brick façade, relating it to the 1960s terraced housing in Ravenscroft Road. Its size and appearance replicate an average new build on estates today. The Healthy House However differs from other buildings in its products, materials and processes. The Healthy House is a concept house which aims to demonstrate to the public and the building industry a new way forward - to encourage a large scale reduction of chemicals in our built environment. Leading environmentalists and academics now believe that it is this cocktail of chemicals ‘outgassing’ into our buildings – new builds are designed to be as air tight as possible – which may contribute to health problems such as asthmas, allergies and multiple chemical sensitivities. The Healthy House uses only natural products. The wood has been treated with a formaldehyde-free natural preservative. The foundations are constructed with Geocell a recycled glass material resembling pumice stone. This is an ecological load-bearing product, which is carbon sustainable and has high insulating properties. Eco-concrete (made with recycled products) was used for the screed. The walls are constructed of Fermacell board, fabricated from raw gypsum and recycled paper fibre. The house is insulated throughout with sheep's wool. The walls are coated with Claywork’s naturally pigmented clay plaster. Earthborn paints have been used which are VOC free. It was necessary to use low VOC paints for the exterior wood - VOC free paints are too thick for spray guns. Alex Whitcroft, Associate Director of Bere Architects, an advocate of healthy housing, writes that ‘nerve and organ disrupting VOCs (volatile organic compounds) are found in virtually every wet finish in the building industry.’ This is something we aimed to avoid. 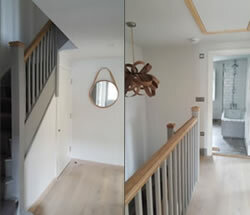 Hardwood oak flooring has been used throughout. The Healthy House is an all-electric house, with solar panels supported by a Tesla battery storage system which holds energy and feeds as required into the house or the grid. This can be monitored with the ‘My Tesla’ phone app. 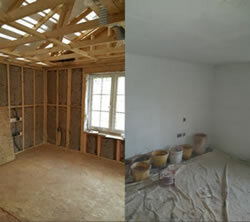 The house is supported and has a contract with Eco Tricity as its supplier, who are leaders in this field. The house has electric heaters, stainless steel sockets (as little plastic as possible was used in the build) and no underfloor heating as this is believed to create an electrical grid. There is wiring for an electric car charging point. A woodburner stove supplements heating in the sitting area. The Healthy House is an all LOCAL house using and supporting local trades: Classic Builders of Watlington built the house, LIFEatNettlebed, local interior design consultants were in charge of the interior, Castle House Joinery from Huntercombe made the hardwood windows, doors, staircase and wooden window shutters, all from sustainable sources, including poplar and Ecologique formaldehyde free MDF where necessary. The kitchen and bath cabinets are made from recycled panelling sourced from an old London house. The Italian company Kerakoll’s zero VOC adhesives have been used for tiling, floors and window sealants. 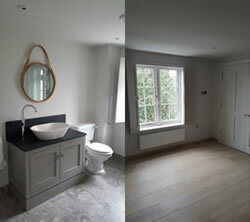 The bathroom has a natural stone floor and slate worktops were used for the sink and cloakroom cabinets. Paul Sims of Solar Sims and Proelec electrical installers have worked in conjunction with each other on the house, both being locally based companies. From the bi-fold windows there is a covered veranda facing the garden which has a fire bowl standing on a piece of locally grown oak. The garden and verges are planted with wildflower turf. Silver birch trees border the garden - silver birch is believed to be particularly efficient in absorbing diesel particulates. The fencing is supplied by Nettlebed Saw Mills and treated with formaldehyde-free preservative. Toxin free concept lighting and mirrors are by Tom Raffields, whose Cornwall based workshop specialises in bentwood lighting and furniture made from sustainable sources. You may have seen his house recently on Grand Designs. The bifold window blind is made from natural linen - wooden window shutters provide privacy and additional warmth. The kitchen has stainless steel worktops... stainless steel is made from natural products – iron, carbon and chromium oxide. Mark Miodownik, Professor of Materials and Society at University College, London writes that stainless steel is ‘self-healing.... even though you can scratch it and break the protective barrier on stainless steel it repairs itself’. We used copper water pipes... now acknowledged to be healthier than PVC which contains ‘persistent accumulative pollutants. PVC can ‘degrade leaking pollutants’ whereas copper is known to kill germs. Cast iron wastes were also part of the specification. The ideas behind both the house and The Healthy Buildings Book - which I hope to be published next year - come from an increasing concern in our world as to the effects of chemical and toxins, in our food, in our health products, in our environment and in our homes and buildings. The Gaia Group – a research organization – states that out of 55,000 building products apparently only 3% are tested for toxicity. The building industry including architects should be asking themselves ‘What are we using... what is it made from... and could it be harmful to human health or our planet?